Metal-Free Dentistry — What Is It? Amalgam is often the preferred choice of material for dental fillings. It’s a mixture of silver, copper, and mercury. Although it is durable, it can be unsightly since its color is so different from that of natural teeth. Dental crowns are often made of stainless steel, gold, or other metals. Again, while these crowns work well, they’re not ideal for cosmetic purposes. Metal-free dentistry takes the obviousness out of restorative dentistry. It employs tooth-colored resin for fillings. 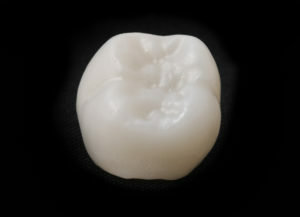 The resin blends seamlessly with the natural teeth around it so the filling is almost impossible to spot. Similarly, porcelain crowns can look like natural teeth. There is no need for anyone to know that you’ve had any work done. The cosmetic appeal of metal-free dentistry is a huge benefit, but the advantages go even further. Tooth-colored fillings are durable. In some cases, they may even last as long as their amalgam counterparts. After you receive a tooth-colored resin filling, you may experience less discomfort and sensitivity than if you had chosen an amalgam filling. Amalgam fillings may expand and contract as they’re exposed to changes in temperature, which could endanger the structure of your tooth. This isn’t a problem with resin fillings. Porcelain crowns will feel like your natural teeth. Metal-free dentistry is ideal for folks who are allergic to certain metals. Are There Any Disadvantages of Metal-Free Dentistry? Many people prefer metal-free dentistry, but it’s important that you are aware of potential disadvantages. Resin fillings may only be suitable to treat small cavities. Also, they may need to be replaced more often than amalgam. Porcelain crowns may be more likely to break than metal ones. Metal-free dentistry may cost more. You should also consider that metal-free dentistry may take more time, particularly if you’re receiving a tooth-colored filling. It also requires a higher level of skill on the part of your dental care provider, so it’s important that you choose a cosmetic dentist in Brownstown who has experience with the procedure. Ultimately, your dentist is the best person to determine if metal-free dentistry is right for you. Discuss the pros and cons with a professional so you’re aware of your options. Metal-free dentistry can give you a gorgeous, well-functioning smile. Why not talk about it with your dentist to discover what it can do for you? Dr. Sammi Hadad is passionate about providing top-notch dentistry to folks in the Brownstown, Michigan, area. She and her team offer metal-free dentistry in addition to a range of other services. If you have questions about how to attain your best possible smile, contact Dr. Hadad’s office at 734-479-4600.